The advertising agency with a difference talks to MOO about ad-blocking, viral videos, and why it chose to break up Mike and Ike. Based in Providence, Rhode Island, NAIL was set up 20 years ago by friends Brian Goss, Alec Beckett and Jeremy Crisp. Describing itself as, ‘an advertising agency that kind of hates advertising,’ its eclectic roster of clients includes New Balance, Rhode Island Blood Center, and Mike and Ike candy. 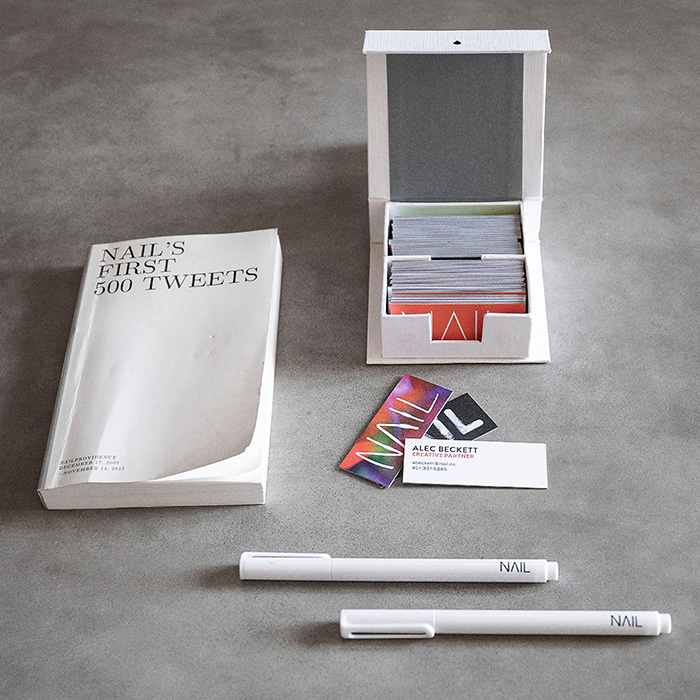 NAIL has also embraced pro-bono social projects including the ‘Don’t Vote’ campaign, which went viral and gained over 20m views. MOO spoke to Creative Director Alec Beckett to talk about ad-blocker dodging, NAIL’s alternative approach to selling, and why the team were responsible for breaking up Mike and Ike. How did you come to join NAIL? I initially went into advertising because I didn’t want to wear a tie to work – that’s pretty much all I knew about the industry. But eventually, I was offered jobs at two big agencies, and also had an offer to join two buddies on a crazy start-up that had been going for six months. One night, I had an epiphany: NAIL scared me – and I should do the thing that scared me. At that point, the agency only had one client, so it wasn’t the most sensible thing to do. But although we had some hungry years, not a day went by when we didn’t have fun – and 19 years later, I’m still here. We offer creativity and ideas to our clients, and don’t care what platform they’re delivered on. Give us a business problem you think communications might be able to help solve, and we’ll try to come up with the ideas that’ll make it happen. We don’t buy media, so we have no financial gain in saying, ‘Do a TV spot.’ We might help create the interior design of a store or some packaging instead. We deliver creativity where we think it’ll give you the most bang for your buck. You’ve described yourself as an agency that ‘kind of hates advertising’. How does that fit with your ethos? We’re in advertising, but the definition of advertising is changing very quickly. Nobody likes to be sold to, and in an era of ad-blockers, our clients are going to find it harder and harder to make anyone care about, or even see, their advertising. But that doesn’t mean they don’t need to attract attention, so we’re trying to get them to stop saying things and do things instead. When you’re intriguing and inspiring people, it’s advertising – but you’re not paying for it. Those you’ve inspired will spread your message on social channels and talk about it. How would you characterize the work you produce? We try to reflect our clients’ needs rather than our personal tastes. We’ve got a diverse client base, which allows us to have equally diverse solutions – if you’re always solving the same problems for the same sort of clients, it’s hard to be fresh and exciting. So you’d be hard-pressed to look at our campaigns and see any common DNA. It’s almost like being a character actor – we want to disappear into the client’s business issue and solve it in a way that has no similarity to anything they’ve done in the past or will do in the future. What’s your creative process once you’ve been given a brief? Rarely does the magic happen by you staring at a pad by yourself, so we start with ‘brief-storming’ – hashing out the brief to see what insights we might stumble upon. We’ll discuss the things we find intriguing or exciting about the client or the category. Then, once we’ve shaped our ideas, we’ll wrap a custom-made team around each project – ‘OK, we’re doing a Facebook and Instagram campaign, so let’s get someone from social and some designers on the team’. This means clients aren’t paying for people they don’t need, and it never feels like we’re falling into a cookie-cutter approach. What’s been your most difficult creative challenge so far? Ideally, a client has something distinctive about them that can be at the heart of our storytelling. But when we were invited to pitch for Mike and Ike candy, there was no product story or other differentiation we could use. We stepped back and said, ‘We have to create the differentiation.’ This lead to the idea of pretending Mike and Ike were breaking up, which went viral. A really big campaign came out of what originally had us staring at the walls. What’s the project you’re most proud of? A bunch of us were stressed about politics in America, and part of that was the youth turnout for voting, which is pathetic. It became a pro-bono project we did for ourselves – how do you crack that riddle, and get young people to vote? We created the ‘Don’t Vote’ video, which blew up – and although you can’t draw a direct line from our film, in the 2018 midterms youth-voter turnout broke records. I like to think we were a little part of that tide, and it was really satisfying to use our creative powers for good. What would be your advice to smaller agencies or freelancers hoping to grow their client network? It sounds trite, but do great work. Every great piece of work you do is essentially an advertisement for you, and a chance to attract like-minded clients. Last year, we had the opportunity to pitch for what would’ve been our biggest account ever, but we realized it would turn us into a different company. We’d be very profitable for two years, but then we’d have no examples of the magic dust of our creativity – so we turned the pitch down. What’s the work culture like at NAIL? We want to enjoy our time at work, which means creating a place we want to work at, and finding people we want to spend our days with. So we look for talent, but also people we like – who are interesting and kind and bring a new perspective. We take pride in not being here on weekends or late into the night. We don’t want to do it, and don’t want our people to have to do it either. You use MiniCards. How does that fit with the brand? We picked that path because we’re not good at normal. We’re trying to sell taking risks, being different and standing out from the crowd, and we couldn’t do that with good conscience if we weren’t walking the walk ourselves. We went with MiniCards because they’re a bit different. Each one has a different design, they look killer, and they’re a good way to start a discussion. Hand over a MiniCard, and you’re guaranteed to start talking about it – it’s a nice way to jump start a conversation with anybody. We dig them. People love them. At MOO, we’ve been helping people make their mark in the world with amazing quality print products for over a decade. And as our customers have grown, so has our service offering. That’s why for bigger businesses—with 10+ employees—we now offer MOO Business Services. It’s MOO + benefits. MOO Business Services combines dedicated account management with an easy online ordering platform and expert design services. It’s a complete package for businesses to give you more brand control and consistency—while saving you time, stress, and money in the process. Please keep comments on-topic and be nice to people. We don't like moderating, but inflammatory, or otherwise inappropriate comments will be deleted. Repeat offenders sent to the MOO dungeons. Whether you've got 10 employees or thousands - we cover businesses of all shapes and sizes. Join other great companies who use MOO Business Services for all their print needs. Graphic designer Chris Rogge chats to MOO about why mono-line illustration means so much to him, and how he balances personal projects with a 9-5. Graphic designer Natalie Luz shares how her background in education and conservation has allowed her to pour her personal passions into her commissions.